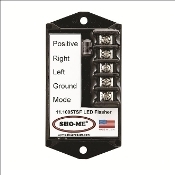 SHO-ME 11.1005TSF LED FLASHER - STROBE STYLE - TERMINALS. This solid-state LED flasher has 7 strobe style patterns: Double Alternating Flash, Mega Alternating Flash, Quad Alternating Flash, Double Simultaneous Flash, Quint Alternating Flash, Quad Simultaneous Flash, Random Flash. Encapsulated unit. Measures - 2"H x 4"W x 1/2"D. Screw Terminals. FOR LED LIGHTS ONLY. MADE IN USA.